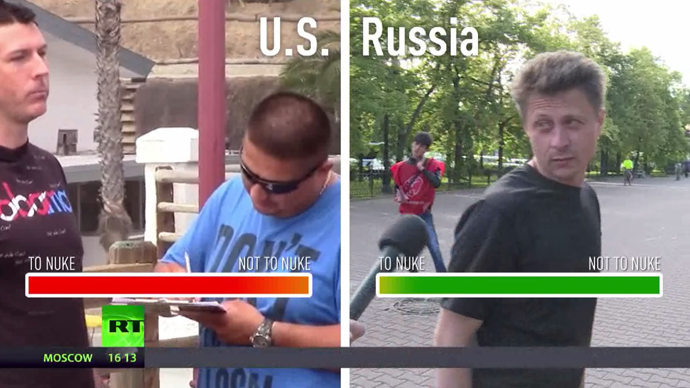 While a majority of Americans asked by a US journalist to support President Obama's "plan" to nuke Russia signed a fake petition to do so, RT decided to conduct its own poll on the streets of Moscow. Most people said no to striking America. Calling the plan "crazy," Russians refused to leave their signatures under a fake "petition" to send missiles to America. People were shocked, commenting "Oh my God!," "Are you kidding?" and "This doesn't solve the problem." "They can do lots of things, but it doesn't mean we have to hit them with rockets and kill innocent people," one woman told RT. Earlier this week, US journalist and prankster Mark Dice offered people in California's San Diego the chance to sign a petition calling for a nuclear strike against Russia, to "maintain America's superiority." The majority of beachgoers didn’t appear to get the joke, and signed the fake petition. Although neither the RT poll nor the one conducted in the US claim to represent public opinion in Russia and America, many found the results of Mark Dice's experiment "disturbing," including the journalist himself. Recently, the Pew Research Center conducted a survey in eight NATO member countries, including Canada, France, Germany, Italy, Poland, Spain, Britain and the US. Its findings showed that NATO nations are hesitant to be involved in a conflict with Russia, especially militarily. Asked whether their NATO country should use military force "if Russia gets into a serious military conflict with one of its neighboring countries that is a NATO ally," at least half of Germans, French and Italians said their country should not take up arms. According to the poll of over 11,000 respondents, Americans and Canadians are the only nations where more than half think their country should use military action if Russia attacks a fellow NATO member (56 percent and 53 percent, respectively). Germans are the most likely to say their country should not - with 58 percent being against military involvement. One of the latest polls regarding a potential military conflict between Russia and the West, conducted in Russia, showed that 31 percent of people feared a US military invasion on Russian territory. The majority of Russians - 55 percent - said they didn’t expect their country to be the first to use nuclear weapons, even in the case of war with the US and NATO. Only seven percent said this was possible, May research released by the independent pollster the Levada Center showed.